Blake & Associates was founded by Catherine (Katie) Blake in 1978 and was the first private physical therapy practice in Cincinnati, OH. When Katie passed away in 2007, Sue DiOrio and Christine Maag became the new owners of Blake & Associates. Blake & Associates is guided by Katie’s original philosophy of providing superior care with a personal touch that is so often missing in today’s changing health care system. We strive to help our patients improve their quality of life and return to their usual daily level of activity and higher. Our therapists have almost 150 years of combined experience and truly enjoy helping patients succeed. We utilize our combined experience and knowledge base, intrinsic sensitivity, and an occasional dash of humor to provide the best possible care for patients of all ages and physical conditions. As a facility, we are focused on complete healing and wellness for the entire body. 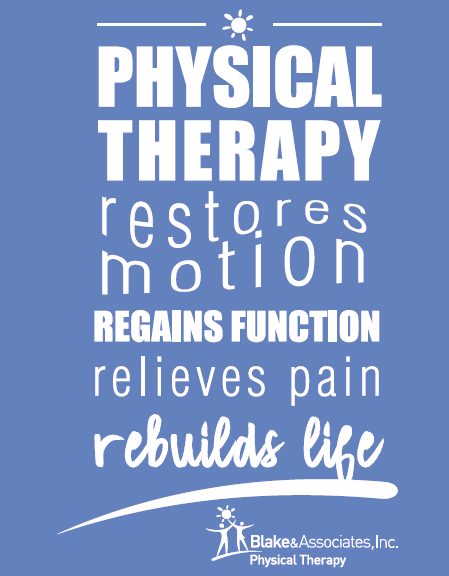 Our comprehensive physical therapy service offers individualized, one-on-one attention and includes the latest technologies and techniques for a speedy recovery.